Practicing solo is my comfort zone. It’s where I belong, where I do my best work, and where I see the most impact in my professional life. Working from my home office, I serve my select group of clients with accounting, forensic economic evaluation, tax, and wealth advisory services. Running a solo operation keeps me engaged and up-to-date on the technology advances I rely upon every day. So what is keeping me up at night? As it turns out, plenty – and I am not alone in identifying the risks faced by CPAs in this fast-paced, ever-changing world we are all navigating right now. The professional risks we all face in serving our clients and employers does not discriminate – the same risks equally challenge us all, from solo operations to the largest international entities, and everything in between. 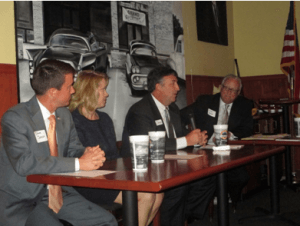 Recently, the NCACPA Charlotte Chapter gathered three different yet extremely qualified CPAs with impressive career stature and accomplishments to host a panel. With Jim Ahler (CEO of NCACPA) moderating, panelists discussed and ranked the various professional risks today’s CPAs face. Had panelists of this program not shared their time, experiences, and understanding I would have still felt alone with my own fears about what is happening in our professional world today. I am so grateful toward J. Blaine Jackson, Carol Lowe and Mike Desmond for their willingness to be frank and open up about the daily challenges they face and the strategies they incorporate to manage professional and enterprise risks on behalf of those they serve. Carol Lowe shared with us the concept of an Enterprise Risk Map, which helps identify the various risks an enterprise faces and needs to address. Turns out there are plenty of risk classifications, areas of concern, and maybe, opportunities for those who become better at identifying and managing these risks. My highlight of the evening was Jim Ahler asking each panelist the key risks each of them saw CPAs facing today. Their answers helped me realize that I am not an isolated professional in my home office, but a key steward in helping my clients identify and manage their individual and enterprise risks. What a special night to feel a part of something larger just by being in the same room where these professionals shared their stories and experiences. When the panelist identified and then discussed their strategies for addressing the risks they faced, I felt empowered to move beyond my fears, identify my own risks as well as my clients’, and do something about them. That night I came to listen, yet then found myself taking serious notes trying to retain what I was hearing. CPAs today face a range of issues, including cyber security, succession planning, maintaining education in order to stay relevant, maintaining client expectations, and staying afoot of the changing communications landscape. It’s important to stay connected to one another as peers and fellow professionals to figure out how best to approach and solve these issues so we can all have successful careers as CPAs. I left the panel discussion wondering how I could stay relevant and ahead of the risk curve myself on so many issues. For me, since I work alone from my home office, I realized I need to stay more connected via technology with fellow professionals to see what they are implementing in order to best serve clients despite the issues CPAs face. A lot of us are learning as we go, so this panel gave me comfort knowing that I can face the unfamiliar territory we are in now by staying connected with peers and other professionals to combat that learning curve. Great program, Charlotte Chapter and NCACPA! Jack A. Heil is a solo CPA practicing in Charlotte, North Carolina since 1989. He received his bachelors degree in accounting from the University of Kentucky and moved to Charlotte in 1985 to work with Deloitte. Currently, he is leading the Solo Business Owners Tribe as well as doing Ironman-level training as a triathlete in his free time.